Free tightening of any gem in the setting. Free re tipping or smoothing of prongs to prevent snagging. Free replacement of diamonds or gemstones, if they break or chip. Appraisals (for insurance or estate purposes) for jewelry purchased, provided at discounted rate. Free clasp replacement on gold chains or bracelets. Free chain or bracelet soldering. Free earring repair, and back replacement, on covered earrings. 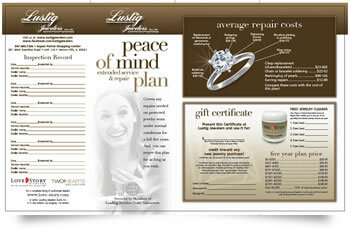 30-day full value exchange privilege on any unaltered jewelry purchase. If you move, the Love Story® or Two Hearts® jeweler in your area will honor this plan!